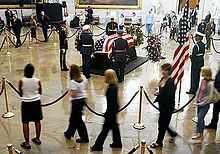 Lying in state is the tradition in which a coffin is placed on view to allow the public at large to pay their respects to the dead. It traditionally takes place in the principal government building of a country or city. It is usually practiced in the United States, the United Kingdom, Canada, France, North Korea, South Africa, and Russia. Lying in state takes place during a state funeral. This page was last changed on 2 January 2015, at 00:08.